From Candace Parker and Lindsay Whalen to Cynthia Cooper and Sheryl Swoopes, Kevin Garnett has welcomed WNBA greats past and present into “Area 21” since the TNT segment launched in 2016. 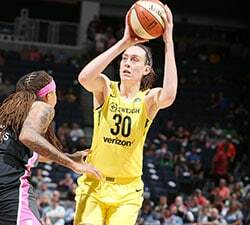 On Thursday, he will be joined by another in Sue Bird, who has followed her third WNBA title by joining the Denver Nuggets as a basketball operations associate this offseason. WNBA.com spoke with KG ahead of the interview about the WNBA-NBA connections and more. Stay tuned to @WNBA for more from our KG interview. 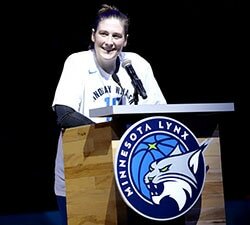 How was it having Sue Bird on your show? Super fun. She’s been on the show before. She’s very high energy. She’s very cheery. I knew I was going to mess with her a little bit with some of the questions about her new position. I was happy that we were able to come in there and follow her around for the day; she still had to work. I don’t know why we thought we could just walk in there when she had to work, but it was a fun time. We had a ball. Why have you made it a point to have WNBA players on Area 21? Someone asked me this earlier today. The story of basketball is a whole story. I think a lot of times you hear from the men’s perspective. Our game is seen globally, but I feel like the WNBA never really gets that type of attention. There are two sides to the story. I really feel that, in order to get to the volume that it should be, people like myself that have a channel should be able to promote and push. I look forward to other channels giving it attention. 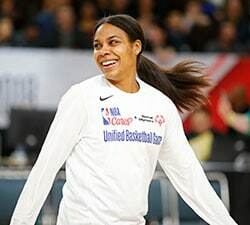 What are your thoughts on the recent trend of WNBA players assuming NBA roles, whether it’s being a coach, scout, analyst and front office executive? First off, I think the perspective is everything. If you ever sat down and talked basketball with Dawn Staley, with Candace Parker — these women are geniuses. They are straight-up geniuses who know the game, who know both sides of the ball, know the ins-and-outs of traps, how it flows, how to take advantage of mismatches. You’re fortunate to be able to catch a lot of the knowledge that you receive in this game over the years, but when you work toward a career, scoring on both sides, coming back commentating and coaching, that’s not easy. Not everyone can do that. What would you say to the naysayers who say these women don’t know the men’s game? People who usually say that don’t really know basketball. It’s basketball at the end of the day. You don’t put a gender on it. A pick-and-roll is run the same way every time, whether a woman is running it or a man. That has no gender. That’s personnel. If you knew right, you would know that the game of basketball has no color, no gender, and that the plays are designed to take advantage of personnel. At the end of the day, the play is the same and that’s what people are quick to forget. These so-called “naysayers” think that a player with brute strength or a player that is more athletic is “better” than a player that doesn’t have that — that to me is ludicrous. Past or present, which WNBA player’s game do you see yourself in? Probably Candace. She does a lot of face-ups. She uses her left hand a lot more than I did. I didn’t even have a left. The left was only there to get to my right. She probably shoots the three a little better than I do. She faces up and uses one hand to extend. She uses the fadeaway, shimmy, spin, counters, up-and-unders. We have very similar games. I call her “grasshopper” because she faces up grasshopper-style.